This study day focused on silvicultural systems that have application in Wales, and more generally in woodlands of the UK. Policy and social dimensions of new technical developments in silviculture were also highlighted. The Wales Woodland Strategy Review, taking place in 2008, will raise opportunities to further progress the principles of multi-functional and ‘close to nature’ forests. The emphasis for forestry in Wales is to provide woodlands that sustain economic, environmental and social values for current and future generations. New forestry practices must be developed and tested to create a strong, self-sustaining natural resources sector in Wales. The general public in Wales need to be assured that their forests can fulfil their stated wishes and are “fit for purpose”. Technical and scientific information needs to be highlighted to aid practitioners. To review the major silvicultural systems that have potential application in Wales, and those likely to meet the requirements of the Wales Woodland Strategy. To highlight operational best practice for taking forward alternative silvicultural systems to clear-felling and systems that transform forest stands from an even-aged to irregular structure. To review policy and social dimensions that influence silvicultural practice and the choice of silvicultural systems. 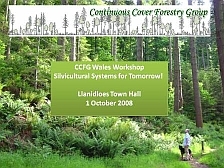 To discuss opportunities and constraints for wider adoption of CCF silvicultural systems, with an emphasis on conditions in Wales. The programme included presentations by leading experts in silviculture, forest policy and social science. Please note that these downloads are provided for CCFG members. This material is not to be distributed without permission of the authors/contributors. Please seek advice if you are uncertain about appropriate usage. CCFG would like to acknowledge Jim Ralph for organising this event. Thanks, Jim!